Have The Angels Been Lucky This Year? The Wall Street Journal had an article about this recently called Baseball's Luckiest Team. It mentioned some things like their AVG with runners on base and how many more games they have won than expected. It also mentions how well their pitchers have done in stranding runners. But with runners on they allow a .264 AVG, 11th best in baseball. They are 5th in that in OPS allowed at .744. They are 10th in AVG allowed with runners in scoring position with .260. 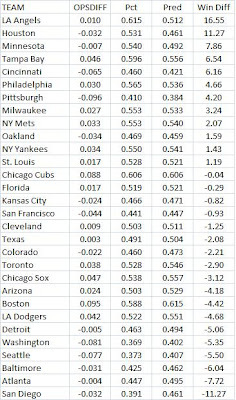 The table below shows how teams ranked in wins above those predicted using this formula (which is based on regression analysis I did a few years ago). With an OPSDIFF of .010, they should have a pct of .512 but they actually have .615! So they have won about 16 more games than predicted (over 161 games-I used that for all teams). You can click on the table to see a bigger image. After the table, I present another analysis which takes clutch situations into account. Then I predicted each team's pct and how many more games they won than predicted. The table below shows how the teams did and again the Angels are first in terms of doing better than expected. Maybe they are lucky. Was Devon White A Good Leadoff Man As A Blue Jay? Last Sunday one of the announcers on the TBS game said that Devon White became a good leadoff hitter when he came to the Blue Jays (I think it was Buck Martinez). Let's see if he was a good leadoff man during his Toronto years, 1991-5. His SLG and OBP were .432 & .327 while the league average was .406 & .335. So his OBP was below the league average, probably not a good sign for a leadoff man. White did steal 31.11 bases per 162 games with 5.68 CS. The league averages were 13.58 & 6.67. (data from the Lee Sinins Complete Baseball Encyclopedia). So he was a better base stealer than the league average, but got on base less often. Since OBP is probably the most important stat for leadoff men, this is not a good sign. The average leadoff man during those years in the AL had an SLG & OBP of .391 & .350 with 33.92 SB & 12.78 CS per 162 games. White has a slight edge in stealing due to his better success rate and a higher SLG but a big deficit in OBP. And SLG is not the key to being a good leadoff man. I explained a fairly complex way of evaluating leadoff men a few months ago. You can read about it at Who are good leadoff men. The basic idea is that hit%, walk%, extra-base-hit%, SB per game and CS per game each has a run value based on which lineup slot you are talking about. As you might guess, walk% and SB% are very important for leadoff men, but less so for cleanup hitters where extra-base-hit% is more important. I had found these run values a few years ago using regression analysis. Anyway, White's marginal run value as a leadoff man was 1.290 while for the average leadoff man it was 1.292. So he was below average. Not by alot, but that is not good. In other words, how many times a player gets into scoring position per out. Since triples are worth about 25% more than 2B's according to run expectancy tables, I multiply them by 1.25. By dividing by outs, the ability to get on base is taken into account since if you make an out you don't reach base. Also, outs include caught stealing. By subtracting HRs I am saying that guys that hit alot of HRs, even though they may have other good leadoff traits, are "penalized" here, since they might be better suited to batting lower in the order. Anyway, White ranked 11th among all AL players 1991-5 with 2000+ PAs. Considering that there are 14 teams and each one has a leadoff man, 11th is not that great a rank. There was an interesting post on this at Battersbox: Lee vs. Halladay. One thing they mentioned is that the batters that Lee has faced this year have a collective OPS of .732 while it is .766 (OPS = OBP + SLG). But how should this difference affect each guy's ERA? I did not see it mentioned or discussed there (my apologies if it was). So I will take a look at this issue. If we multiply 13.26 times .034, the difference in the OPS of their opponents, we get .45. If we use 12.07, we get .41. If we add that to Lee's ERA of 2.36, we get 2.77 or 2.81. Halladay is at 2.77. That makes things pretty even. But what if we look at DIPS ERA, an ERA computed based only on things the pitcher controls himself like strikeouts, walks and HRs (DIPS means defense independent and was developed by Voros McCracken). Lee has a 2.85 DIPS ERA and Halladay has 3.06. So then Lee would jump well above Halladay in ERA. Now we don't how good the pitchers were that these batters faced. Maybe the batters who have a collective OPS of .732 (the ones Lee has faced) faced unusually good pitchers. Probably not, but we do need to note it. If not, then this analysis gives the edge to Halladay. Halladay came into today with an edge of 14 in IP (224 to 210). He pitched 7 more today. Given that he will end up with more IP (it might not be as much as 21, though depending on how much each guy pitches from now on), Halladay has a case for the Cy Young award. Technical note: The standard error in the OPS/Runs regression was about .15 in each case or about 24 runs a season. Certainly not the best estimators around but decent and OPS is the stat at issue here. How Good Are Playoff Bound Teams At Preventing Homeruns? Last week a commentator on a game (I think it was on TBS) said that the White Sox might have problems in the playoffs since they rely on HRs so much and pitchers in the playoffs are good at preventing HRs. 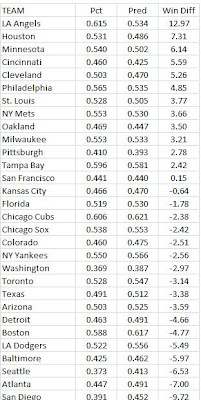 So I looked at all the playoff teams in both leagues over the last three years and compared their HR rate allowed (HRs divided by batters faced) to the league average. Over that time, the NL playoff teams allowed about 1.5% fewer HRs than average. The AL teams allowed about 5.3% fewer HRs than average. How might this impact the White Sox if they make it to the post-season this year? Suppose their season rate of hitting HRs is 1.5 per game (it is not quite that high, but close). Then even if that goes down 5.3% in the playoffs, that still leaves them with about 1.42 HRs per game. If a typical HR is worth 1.4 runs (using the linear weights value from Pete Palmer), the White Sox would lose about .112 runs per game (since .08*1.4 = .112). If a typical playoff team hit 1 HR per game, then that goes down to .947 a game in the playoffs. That would cost them about .074 runs per game. Now the difference between what the White Sox lose and what the typical team loses is less than .04. Not very big. And the other teams will probably see something that they do better go down more than for the Sox and suffer bigger loss (like in stealing or walking or just plain hits-remember that the pitching staffs of playoff bound teams are probably better than average at other things than just preventing HRs). Then that brings the two teams even closer togther. The Sox reliance on the HR is not a big deal.